Thursday April 22nd 1926 Wrote Hattie. Then down to The Hospital and on to The Roslyn. I had Mr & Mrs Peckham there to lunch with me. She stayed till three oclock. I came to Otts office. Letter from Hattie. Evening at Matties. Friday April 23rd 1926 I called on Fern Patterson before stopping at Otts office. Then to Mrs Hornes near by. She took me lunch and a show. After that I went to the S P Office and bought my Pullman ticket. Went to see Warner a few moments and to 1626 1/2 to go home with The Sieberts. Bess went out with us and Emily and Charles there later. Fine day. wrote Winnie. Saturday April 24th 1925 I did some washing and packed my trunks. Wrote Hattie and Birdie. I came down to the city about four oclock to see Warner and then to The Victor to see The McCalls. Stopped at Otts office. Letter from Cousin Jen. On out to Matties. 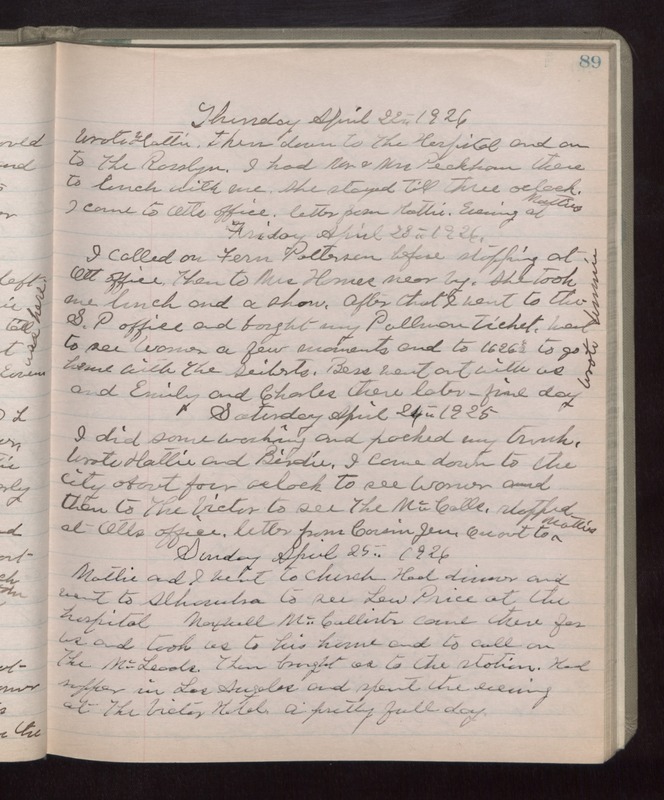 Sunday April 25th 1926 Mattie and I went to church. Had dinner and went to Alhambra to see Lew Price at the hospital. Maxwell McCallister came there for us and took us to his home and to call on The McLeods. The brought us to the station. Had supper in Los Angeles and spent the evening at The Victor Hotel. a pretty full day.